Check out the early spring lawn care tips for your Maryland home. The weather is warming up in Maryland, and it is officially the start of the spring season! The beginning of spring comes with lawn chores and landscape maintenance, and while these may not be the most fun activities, they are crucial for getting your grass on track for a healthy growing season. Continue reading for a few early spring lawn care tips for your Maryland home to get your landscape ready for the warm weather. The first step in your lawn care maintenance schedule should be to clean up your lawn from the debris of winter. Gather any twigs, branches, trash, and other items to make your grass a clean slate for necessary maintenance. You can also rake out any dead grass on your property and add it to a compost pile with small twigs and leaves. Since your mower has been stored away for a few months, it’s important to check it over before turning it back on. Be sure to change the oil, air filter, and spark plug, and give it a good clean by removing any dirt and grass clippings. Inspect the mower blade to see if it needs to be sharpened and replace it if it has large nicks or gouges. 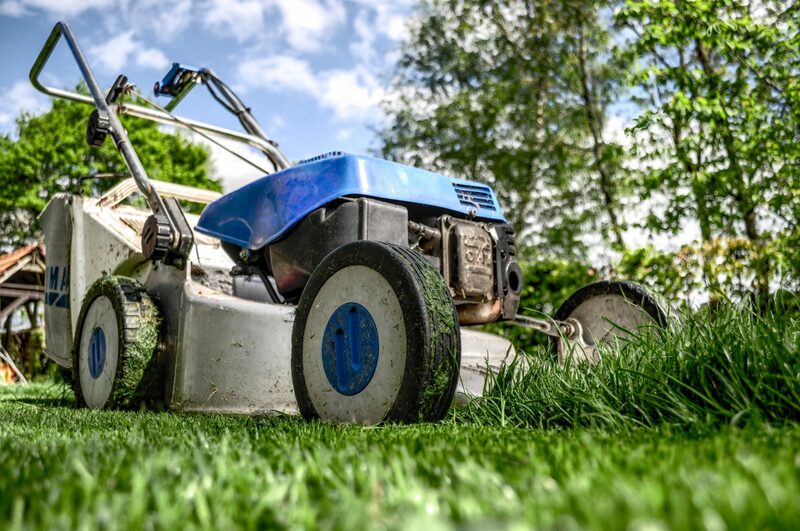 It’s also important to note that a cold mower can be difficult to start in the early spring, so it’s a good idea to allow it to warm up in the sun for an hour or two before starting. Also, make sure it has fresh gas. If it’s possible, the gas tank should be empty going into the winter storage period. When it is time to mow, it’s critical to adjust the mower deck to cut at the highest possible setting for your grass. The majority of turf types do best with a three to four-inch blade height, which usually corresponds to the mower’s highest setting. However, if you have Zoysia or Centipede grass, choose a middle setting, and the lowest setting for Bermuda grass. Keep in mind that you should never remove more than 50% of new growth. Early spring is also the time to apply mulch but be sure to wait until the soil has warmed up. Shredded mulch provides a nice finish to any planting bed and vibrant color to your landscape. Mulch is also great for preventing weed growth as it blocks access to the sun, so be sure to apply a two to three-inch layer around (not on top of) your plants. Scientific Plant Service, located in Baltimore, is a privately-owned corporation, chartered in Maryland in 1957 by Frank J. Burke. We started as a full-service Arborists specializing in the care of shade trees and ornamental shrubs, but today we are a Lawn Care company that is a huge part of the community. From aquatic environments and snow management to deer and mole control, SPS has services tailored specifically for your lawn and landscape. We offer services in Maryland, Washington, DC, and Virginia, including Harford, Baltimore, Carroll, Frederick, Howard, Anne Arundel, Montgomery, Prince Georges, Talbot, Calvert counties in MD, as well as Loudoun County, Fairfax County, Arlington, Alexandria, and Falls Church in VA. For more information, contact us online, or call us at 410-321-0970. Be sure to follow us on Facebook, Twitter, LinkedIn, and Pinterest! This entry was posted on Thursday, March 21st, 2019 at 12:24 pm. Both comments and pings are currently closed.